Lilacs (Syringa spp.) come in all shapes and sizes. Their panicles of tubular blooms vary in color from white to deep, bluish-purple, although lilac purple-pink is the classic color. These showy shrubs grow in U.S. Department of Agriculture plant hardiness zones 2 through 8, depending on species. Use the flowers to create elegant dried floral arrangements by either air-drying them or burying them in a desiccant material. The delicate flowers of lilacs can decorate your home when properly preserved. Air-drying is a basic, simple method of preserving lilac flowers, although pink blooms tend to fade. Hang bunches of lilac blooms upside down in a dark, warm and dry area. Raised screens or drying racks also work well for air-drying. This method can take three weeks or more. Burying lilac blooms in a desiccant ensures colorful dried lilacs. 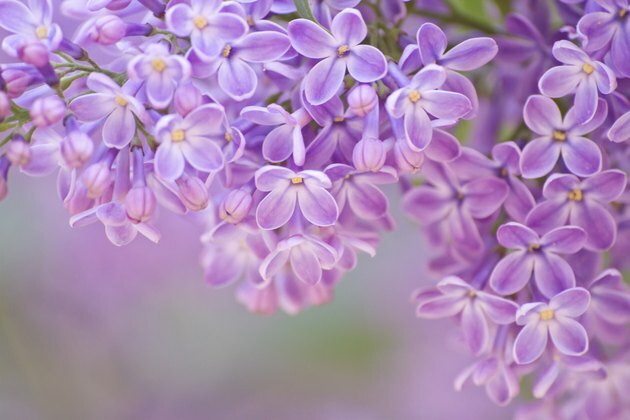 You'll need an airtight container large enough to hold the lilac stem and flower and deep enough to bury it in silica. Place a small amount of silica in the container, then the lilac bloom, and carefully and slowly pour silica gel crystals over the bloom to cover it. Pouring too quickly or without caution can damage the blooms or misshape them. Mixtures of sand or cornmeal and borax also work -- mix either sand or borax together at a ratio of 2 parts borax to 1 part sand or cornmeal. Silica can take one week, while borax mixtures can take two to three weeks.